Bawih Lian Peng, age six, of Cang Ai village. Note the round burn marks on his forehead and cheeks, a practice thought by the villagers to cure sicknesses. I don’t often find myself praying for village chiefs in Burma who are burning with fever from malaria. But there he sat, in the darkness of his bamboo hut, wrapped in blankets to keep warm on a hot afternoon. He is my friend and brother in Christ. Last year when I met him for the first time, he was leading the village people in praise to Jesus. They were so thankful for the mile-long plastic pipe Heaven’s Family had provided to bring water from a distant spring after an earthquake had destroyed the village well. With a faint voice, the chief told me that he had already lost two of his grandchildren, age two and five, to malaria earlier in the year. Three other members of his family were now suffering as well. But there was no money for medicine or doctors. All of the villagers are very poor subsistence farmers. All that was needed was fifty-five dollars. Thanks to Heaven’s Family partners, I gave him that. He and his family members have all since recovered. There is no road that leads to Cang Ai—only an ox cart path. The village is off-limits to foreigners like me, but my Burmese hosts paved the way by “giving thanks” to the local authorities. When I arrived with my son, Stephen, news quickly spread and the villagers came out in mass to greet us. They wanted to show us that water was still flowing from the pipe Heaven’s Family had provided. This was a project made possible by contributions to the Safe Water Fund. As I took portraits of the children and proud mothers with their babies that afternoon, I wondered how many of them might not survive 2008. Malaria kills more than one million people each year around the world, but a five-dollar mosquito net reduces the chance of being infected by 50% and more. Because of your help, every person in Cang Ai village will soon be sleeping under such a life-saving net each night. Thanks so much. You can viewthea two-minute video, Safe Water Fund, that Stephen filmed at Cang Ai. Tired of shallow prosperity preachers who show off their “faith” by means of all the treasures they are laying up on earth? Then let me introduce you to a friend of mine, a 76-year-old woman named Pi Kimi. Born among the Mizo tribe that straddles Burma and Mizoram State in India, Pi Kimi is poor on earth but rich in heaven. View a short video of a traditional Mizo bamboo dance that few people outside of Mizoram have ever seen. It was performed for us by some of Pi Kimi’s kids. Years ago, Pi Kimi opened her home to orphans, and she’s never stopped. When I visited her in December, she had ninety children living with her, twenty-eight more than last year. She knew that I was scolding her, and so she stood to her feet, and for ten minutes I listened to her heart through my interpreter. It was an impassioned speech. She said, “When the Lord sends unwanted children to my door, I can’t turn them away. So I trust that He will help me take care of them.” She has amazing faith for someone who lives in one of the poorest nations in the world. Perhaps that is why she named her orphanage, “Jehovah-Jireh Children’s Home.” The Lord is indeed her provider. Her faith has resulted in fifty-eight of her children being sponsored through Orphan’s Tear. There were tears in her eyes. I could feel the presence of the Holy Spirit as she spoke, and I recognized once more that I was looking at a woman who is highly-esteemed in heaven. She had been asking me for months to help her build a 2,300 square-foot brick boy’s dorm. It would only cost $14,000. Her orphanage is so crowded, and children are sleeping like sardines on the floor. Before I realized what I was saying, I promised her I’d send her the money she needs within two months! It was like the Holy Spirit spoke through me, but I’ve been fighting doubts ever since! To my even greater surprise, I also felt inspired to promise another friend of mine, a widow named Rin Sang Pui, that we would send her the $14,000 she needs to construct a new dormitory for her orphanage. Her heart is also full of compassion. Last year when I visited her, she had eighteen children. This year she had thirty-eight. They all live in a tiny wooden one-room house. She also told me with tears that she found it impossible to turn orphans away. You can watch the two-minute video of her current orphanage, Dorms for Orphanages, Mercy Children’s Home. When American missionaries John and Beth Carey first met Clara and her son Chophan four years ago, they were living in a leaky and dilapidated two-room village house in post-communist Kyrgyzstan. Neither knew Jesus, and before long, both became very ill. Chophan contracted tuberculosis and Clara, just skin and bones, found a thyroid tumor growing on her neck. The Careys led Clara and Chophan to the Lord, and funds for their medical treatment were provided by Heaven’s Family. Chophan had to spend eight months in the tuberculosis hospital, and Clara had a large tumor removed from her neck. Now they are both healthy and happy! They were also able to move from their old leaky house to a better one-room cottage, although it was never intended to be inhabited in the winter, but built as a summer get-away during communist times. This past summer Clara worked hard in her garden to raise and sell food to provide for herself and her son. But she asked the Careys, who live on next to nothing themselves, if they could help her with coal for heating and some basic food products through the cold winter months. Heaven’s Family has provided the funding needed, and John delivers coal, flour, oil and juice every Friday to Clara’s house and conducts a Bible study for her unbelieving neighbors. John is a super soul winner who knows the difference between American Jesus and Bible Jesus. 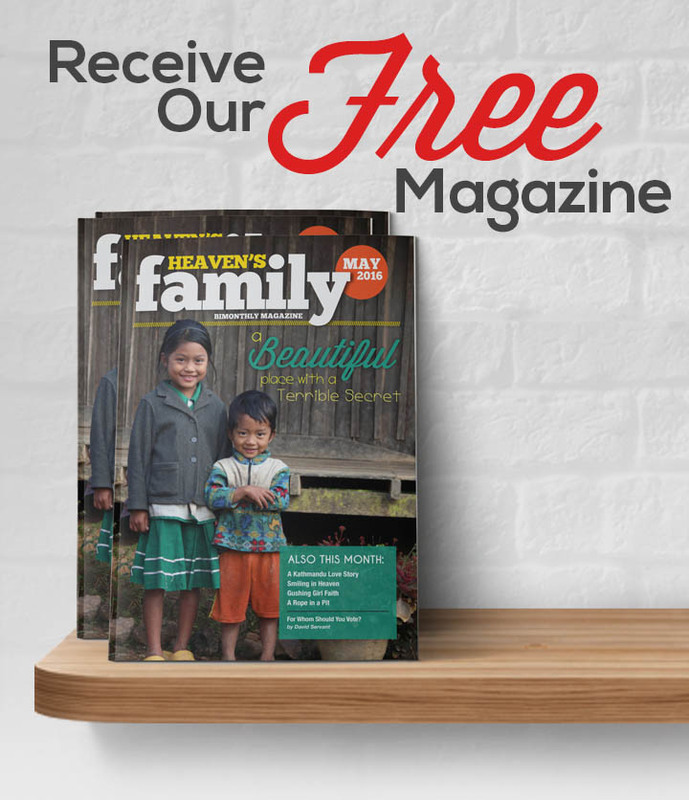 Heaven’s Family is helping the Careys feed seven other poor, single-parent families in Kyrgyzstan this winter. Five of the single mothers are believers whom the Careys and their co-workers have led to the Lord. Pray that the other three will soften their hearts as they experience Jesus’ love. All of them are being threatened by Muslim leaders not to accept help from Christians. While in Burma, Associate Minister Chuck King and I conducted a two-day conference for thirty-three national missionaries. During one session, our band of fifteen Americans broke into small groups with the missionaries and interviewed them. We met with men and women of whom the world is not worthy. Evangelist Sang Bel is one of them. He’s unknown outside of Burma, but he is very well known in heaven. He’s traveled for forty years preaching the gospel, often to remote areas where people have never heard of Jesus. Because he has so little money, most of the time he walks to his preaching points, as many as nine days at a time. And he has seen amazing results, as thousands of sinners have repented and become new creations in Christ. Many times hostile villagers or local authorities have made attempts on his life, but the Lord has delivered him. We asked all thirty-three of the national missionaries at our conference to fill out an application-for-support form and tell us about their experience and ministries. With this information we are further expanding our “National Missionaries Fund” by which rich people (like all of us reading this) can partner with amazing men and women of God in poor places and help them be more effective in their ministries. Who wouldn’t want to support Sang Bel and reap the rewards with him in heaven?!! This is better than the IPO of Google! Stay tuned for more information as we develop this program. We intend to have a place on the Shepherd Serve website where you can browse through the photos and testimonies of national missionaries and find one that you want to help—according to your ability. For now, we’re sending all contributions to the National Missionaries Fund to national evangelists whom we personally know and trust, like Sang Bel in Burma. I’m leaving the country once again on January 3rd to minister in Haiti, the Western Hemisphere’s poorest nation, and in the Dominican Republic. Your prayers are appreciated. I’ll be meeting some of our ministry friends, new and old, on January 19-21, in Sonoma, California and in Phoenix, Arizona. For more details, please email us. Please tell us if you are interested in information about Sonoma or Phoenix. Have you visited the Shepherd Serve website recently? In November, one of our free songs, God of Tears, was downloaded 1,099 times. People visited from 93 countries, and in the past twelve months, we’ve received 2 million hits. We have many teaching articles posted there in many languages. Want to join our team next November in Burma? Start praying about it now! For information, email us. Our God is a rewarder of those who diligently seek Him (Heb. 11:6). May 2008 bring you closer to Jesus than ever before! Not everyone in Cang Ai village was happy about having their photo taken!